W. W. Norton & Company, 9780393292572, 240pp. The family farm lies at the heart of our national identity, yet its future is in peril. Rick Hammond grew up on a small ranch, and for forty years he has raised cattle and crops on his wife's fifth-generation homestead in York County, Nebraska, in hopes of passing it on to their four children. But as the handoff nears, their small family farm--and their entire way of life--are under siege. Rising corporate ownership of land and livestock is forcing small farmers to get bigger and bigger, assuming more debt and more risk. At the same time, after nearly a decade of record-high corn and soybean prices, the bottom has dropped out of the markets, making it ever harder for small farmers to shoulder their loans. All the while, the Hammonds are confronted by encroaching pipelines, groundwater depletion, climate change, and shifting trade policies. Far from an isolated refuge beyond the reach of global events, the family farm is increasingly at the crossroads of emerging technologies and international detente. Following the Hammonds from harvest to harvest, Ted Genoways explores this rapidly changing landscape of small, traditional farming operations, mapping as it unfolds day to day. 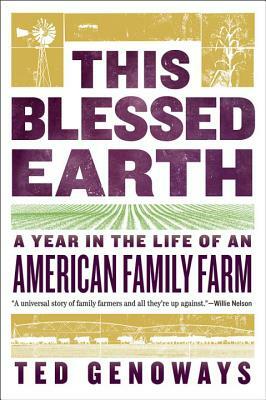 This Blessed Earth is both a concise exploration of the history of the American small farm and a vivid, nuanced portrait of one family's fight to preserve their legacy and the life they love.